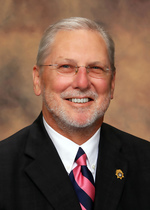 JACKSONVILLE, AL – Memorial services for Ronald Eugene “Ron” Wood, 63, will be on Thursday, March 14, 2013 at 6 pm at the K.L. Brown Funeral Home and Cremation Center Chapel with Rev. Bob McLeod officiating. The family will receive friends at the funeral home from 4-6 pm prior to the service. Mr. Wood died on March 11, 2013 at his home outside of Jacksonville. He is survived by his wife of 34 years, Carol Hamlin Wood of Jacksonville; his mother, Sara Sutley Wood of Jacksonville; his brother, Randal Lee “Randy” (Gayle) Wood of Ohatchee; his uncle, Eugene C. “Gene” (Treva) Sutley of Ohatchee; his in-laws, Arnie and Pat Hamlin Joneson of Fort Payne; two nephews, Nathan Manning of Seattle, Wash. and Joshua (Tina) Manning of Norfolk, Vir. ; and his surrogate children: nine dogs and three cats, especially his Buddy. Ron was born at Anniston Memorial Hospital shortly before his father went back into the U.S. Army. Being an Army brat, Ron grew up and went to school in a wide variety of places around the world: Sendai, Japan; Isle of Palms, SC; Fort Benning, GA; Fort Bragg, NC; Bad Kreuznach, Germany; and Evreux, France before finishing high school in Jacksonville, his mother’s hometown. He was a member of the JHS class of 1967 and played on the JHS basketball team that won the Calhoun County Tournament that year. Mr. Wood was voted onto the All County Tournament and All Anniston Classic teams. Although he never played college basketball, that was his favorite sport to watch on TV. Ron worked in the medical profession as a scrub-tech and surgical assistant before attending Birmingham School of Law. After receiving his law degree and being admitted to the Alabama State Bar, he worked for nearly 20 years as an Assistant District Attorney (ADA) in the 7th Judicial Circuit of Alabama (Calhoun and Cleburne Counties). As his career as a prosecutor evolved, Ron served as mentor to incoming ADAs including Brian McVeigh, the current District Attorney for the 7th Circuit. During the ‘80s, prior to becoming a prosecutor, he played bass guitar in Sunny Beaches, a popular band in the area. Throughout his adult life, Ron had numerous bouts with cancer and kidney disease. In early 1977, doctors gave him six to nine months to live. Despite the dire prognosis, he managed to live another 36 years with the help of many caring physicians and medical personnel. Members of the Hawg Family and Ron’s many close friends will serve as honorary pallbearers. Mr. Wood was preceded in death by his father, LTC George E. “Gene” Wood; his grandparents, Cecil S. and Nancy Myrick Sutley and John and Lola Dollar Wood; his uncle, James H. “Jimmy” Sutley; and numerous aunts and uncles on the Wood side of his family. The family would like to extend special thanks to the staff, doctors and nurses of RMC Anniston ICU and New Beacon Hospice.